Through two rounds of the 2018 PDGA Professional World Championship, a star-studded lead card has risen to the top of FPO. Paige Bjerkaas had a barnburner of a round on Fox Run Meadows to create some separation between herself and the field, and the three-way tie for second between Paige Pierce, Sarah Hokom, and Rebecca Cox leaves some breathing room over the next tier of players as well. Here’s the rundown of the day two performances from the four players who have been the clear best through two rounds. Bjerkaas made the first big move of the tournament on Thursday. After a fairly quiet first round from the FPO division, with all of the top players finishing right around par, Bjerkaas put together a spectacular round two. She shot 5-under par 58, the only under par round on the day, to bring Bjerkaas to 3-under par 121 total, six strokes clear of the rest of the division. The round stands as an unofficial 1021 rating, the highest of Bjerkaas’ career and nearly 40 points higher than any other competitor on Thursday. Bjerkaas’ approach was simple enough. She played conservatively all day, avoiding out of bounds until the 18th hole, which was also the only hole she bogeyed. She took her birdies when they were available and otherwise simply sought to play mistake-free golf. Bjerkaas was happy to throw putters when others were using drivers. As a result, she shot 11 pars, maximizing the value of her six birdies. Word of Bjerkaas’ round quickly spread around the tournament. She was congratulated by just about every big name player from both divisions at Tournament Central, and for Bjerkaas, that was a cool experience. After round two, Pierce is tied for second place. She improved on her opening round at Brewster Ridge, shooting an even par 63 for a 127 total. Still, Pierce’s second round was more like her first than she would have liked as she struggled to find consistency throughout the round. 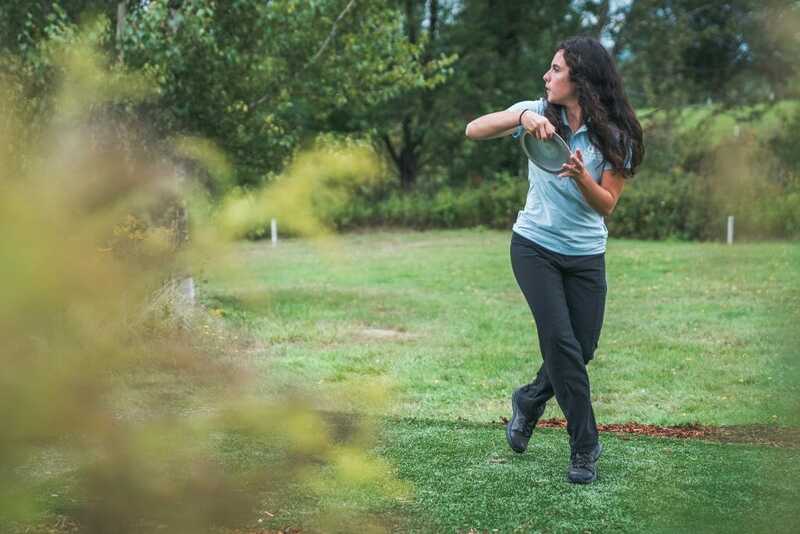 According to UDisc Live stats, Pierce led the division with a 44-percent birdie rate, yet again was plagued by a double and triple bogey on her scorecard. After round one, Pierce said she needed to do a better job off the tee, and, on that, she delivered. Her fairway hit rate rose 13 points to 74 percent on the more open fairways of Fox Run. Unfortunately, it coincided with a putting dip, as she fell from 95 percent from inside the circle to just 75 percent. With three rounds to play and Pierce’s ability to get birdies, the six stroke deficit isn’t an issue yet. “I’ve just gotta get rid of the errors. I know I can birdie. I just gotta capitalize, that’s as simple as it is. I’m getting the birdies, I just gotta get rid of the errors,” said Pierce. It’s a testament to the highs of her rounds that Pierce is still within striking distance after posting so many red scores through two rounds. She led FPO in birdies during round two (8) and was tied for the lead in round one (5). If Bjerkaas continues at anything close to the level she played at today, though, the time is running out to eliminate the miscues. Bjerkaas easily had the round of the day, but in the early going, it looked like it would be Hokom putting together a special showing. She went 3-under par through six, which at that time had her tied for the lead. She was only able to grab one more birdie for the rest of the round, though, and struggled through a bout of bogeys in the middle stretch of the course. Hokom still finished with one of only three rounds of par or better on the day. The charge at the lead may not have happened, but she did enough to stay in the hunt. Hokom finished the day in the exact same position as Pierce, shooting an even par 63 for a 127 total. Cox, the leader after round one, struggled to find the same form. She hit more birdies, six, but her round one lead was built on avoiding bogeys, and she wasn’t able to match that on Fox Run. Cox threw a 4-over par 67 to move her to 3-over par 127 total. Out of bounds was the bane of Cox’s existence on Thursday; her seven OB strokes were the most of any player in the top 18. It was sometimes execution problems that found OB, but she also had some awful luck. On hole 14, when her drive looked to set her up for a birdie, Cox’s disc knicked a guardian tree, putting it on a bad angle and causing a slow roll down the hill and out of bounds. She did have some more controllable errors, too, though, and those really cost her with her card mate Bjerkaas playing such a clean round. As a result, her three stroke lead after round one, is now a six stroke deficit. The lead card of Bjerkaas, Pierce, Hokom and Cox tees off at 9:30 am local time on Brewster Ridge. Smashboxx TV will be livestreaming the round, follow along here at Ultiworld Disc Golf for coverage, and check UDisc Live for up-to-the-minute scoring. Comments on "Bjerkaas Shoots Career-High Rating To Take Lead At Pro Worlds"